Northborough prices are headed up, but they haven't really spiked. With prices pad still under $225, you're dollar is going further in Northborough. Inventory remains tight - and sellers are remaining optimistic about the future, with some of the most aggressive asking prices yet. What should potential home buyers do in Northborough ? Well they should be super careful right now - much of the market is overpriced. But if the new seasons inventory comes on, and it's priced right, be aggressive and go get it! Sign me up for Automated E-mail Alerts of New Listings in Northborough! What should future home sellers do in Northborough ? When the market has a big pricing gap like this - sellers asking too much in advance of where buyers are - it's a good strategy to pick a reach price that looks lower than your competitors. You'll still get a premium, and sell quick as a cherry on top. There are 28 homes actively listed as For Sale for Home Buyers. In Northborough there have been 109 houses sold in the last 6 months, and 63 homes sold in the last 3 months. The Average number of Days on Market was 36 days for recently SOLD homes In Northborough. 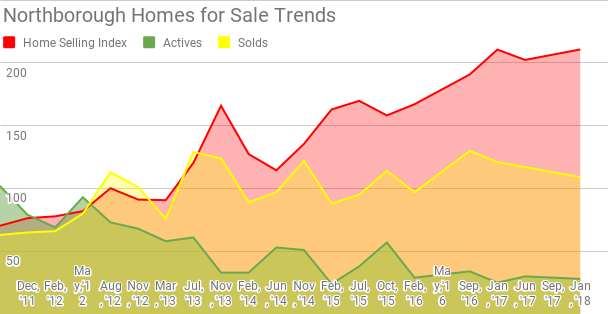 Homes for sale have been sitting for an average of 127 days homes For Sale (currently for sale). Northborough , MA, has 3 properties advertised as lender owned or foreclosure (typically foreclosure) .